Recently I had the privledge of visiting Hawaii for a week with one of my best friends. We started with a vaugue idea of what we intended for the duration of our trip, but we knew that we wanted to hike as much as possible. My parent's condo was about a ten minute walk from Lanakai beach which was pretty incredible to be so close to. Kailua Bay is a wonderful town to spend time in as well if you are in the area. Since we were based in this area and we had access to a car, most of the places that we saw were close to Kailua. We endavored to do a hike every morning, which did not end up happening due to weather, however we did go on quite a few. I believe that my favorite was actually the first that we did. Since there was a bit of a time difference we woke up just as the sun was rising. The Pillbox Hike is a realtivly short hike that has an incredible view of Kailua Bay. From the top of the Pillbox there in a sweeping view of the mountains that separate the island and the water that opens up into the vast ocean. At sunrise it is truly amazing, as the sun breaks over the water it is unlike any other site. This hike isn't incredibly challenging, it is steep but relativley short. 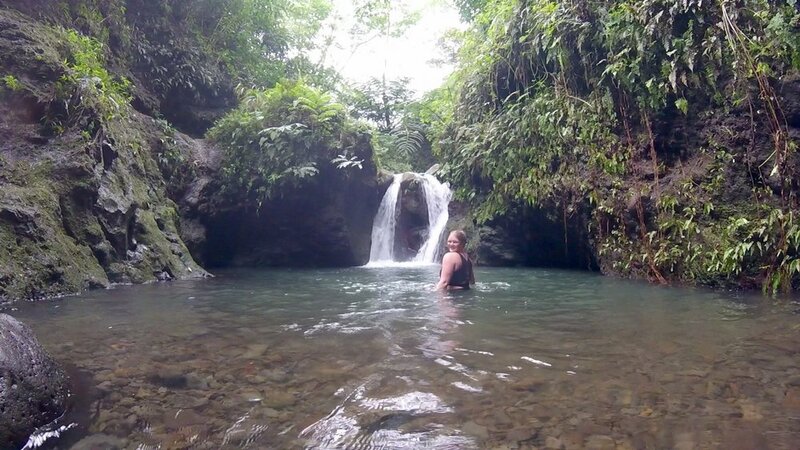 Manawili Falls is another hike that is very close to the Kailua bay area. I will say one thing about this hike however, it is very muddy. At one point I took my shoes off and walked barefoot since I was slipping so much in my shoes. This hike is moderately long, however I think that the view is worth it. Once you reach the waterfall, I believe that the best site of all is past the first waterfall. If you climb up the rock on the side of the first waterfall and follow the water beyond, there is a second smaller waterfall. My favorite part about this was the I was entirely alone in a little pool by the water. This hike is more challenging but with a high reward. Koko Head Stairs hike was the most difficult hike that we completed. The entire hike follows an old train rail on wooden stairs. When looking up the mountain, it is a daunting site since it quite literally goes straight up. Makapu Lighthouse lookout was more of an inclined nature walk than a hike, but it has beautiful views nonetheless. There is a concrete path that leads up to the lookout point on top of the mountain, which is great to follow. However near the top if you take a slight right turn along a dirt and gravel path, you can find even more. This path took us along the side of the outlook, protected by a little white fence. It leads to a cute little lighthouse, which is gated, but it is still beautiful to see. Diamond Head State Monument was a hike that I would say was on the easier side. It is also a very popular hike, so it would be better to visit earlier in the day. One of my favorite parts of this hike was the way that you could see the entire crater, which is what you traverse up in to the top. On the other side of the viewpoint, you can see a huge section of Waikiki Beach spread out before you, skyscrapers and all. It truly is a beautiful dichotomy. Climb down to the Tidepools at Makapu'u. This was something that was a bit on the dangerous side, however it is worth it. Down in the tidepools you can stand right next to the water as it breaks, it is pretty incredible but please take caution if you go an see it. This turnoff was very close to the KoKo head hike, so if you are on the way check it out! One of the most relaxing evenings I had in Hawaii was spent on the North shore, watching the surfers ride waves. We are arrived at the beach shortly before the sun was setting, which was a beautiful site to see. Since we were staying in Kailua Bay, the sun usually set over the mountains, so it was really special to be able to watch the sun sinking into the water as it casted out its rays. Lanakai Beach was the one that we visited most often, and it was also one of my favorites. We went and hung out here a few days around sunset and it was a magical experience. There is just something about the tropical colors of Hawaii painted across the horizon. One of the afternoons we decided to do an activity that would be both fun and inexpensive. We borrowed bikes from one of my childhood friends and rode them around the cute little town of Kailua. One of our favorite things to do was to explore the different little neighborhoods and to look at the unique houses. We saw anything from beach shacks to million dollar mansions and it was a great use of an afternoon. Another activity that we were able to do by borrowing equipment was SUP in the ocean, which provided a refreshing challenge. With the waves of the ocean, it made the paddle boarding more difficult and fun. Standing on the water looking out at the vast expanse of the ocean in front of me was one of my favorite parts of the trip. The Hawaiian islands are a place in the world that I have visited a few times, but I always love returning and seeing new things. This was a place that I was so excited to visit with one of my best friends. Have you ever been to Hawaii? What is your favorite Island? Let me know in the comments.